In the Wings: Hark... who goes there? Yes so it has been a while since I've said something... and it's not that i've had nothing to say... quite the opposite actually. 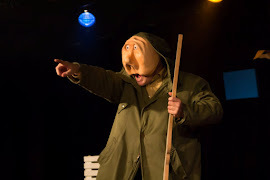 Our second term ended and as I was taking off my costume from playing Polonius in our Commedia dell'Arte version of Hamlet the taxi whisked me away to the airport for a two-week break back home in Joburg. Two weeks of family, our pets, the swimming pool and... I know I keep banging on about it... SUNSHINE! This is my fifth winter in a row! So I feel quite excited about summer clothes and sandals. Rewind. So now... Hamlet. In 22 minutes. Mmm the full play in 22 minutes. Well not the full play... But our version of the full play. What a riot. And of course it was wonderfully mad... with only the odd Shakespeare line thrown in here and there. Something is rotten in the state of Denmark! Frailty thy name is women! To be or not to be... you know, all the big hitters. Naturally. In short... we worked out an event narrative structure (called a canovaccio in the world of Commedia) and then the idea is to improvise within this... but you have the structure to lean on and support you. And herein lies one of the differences between acting and playing... the actor will execute the structure as it is - moving from one beat to the next. The player allows whatever new happens to happen and if the audience responds then they go deeper into that until it is over and only then do they return to the structure and move on. For the most part we only found a few moments of raw play... but when they happened it was so exhilarating. It requires a whole new level of listening... because it is not pure improvisation. You know what is going to happen... but how it happens can change and develop and grow. And if something new is planted in an earlier scene it can come back in a later scene. It is definitely not boring. 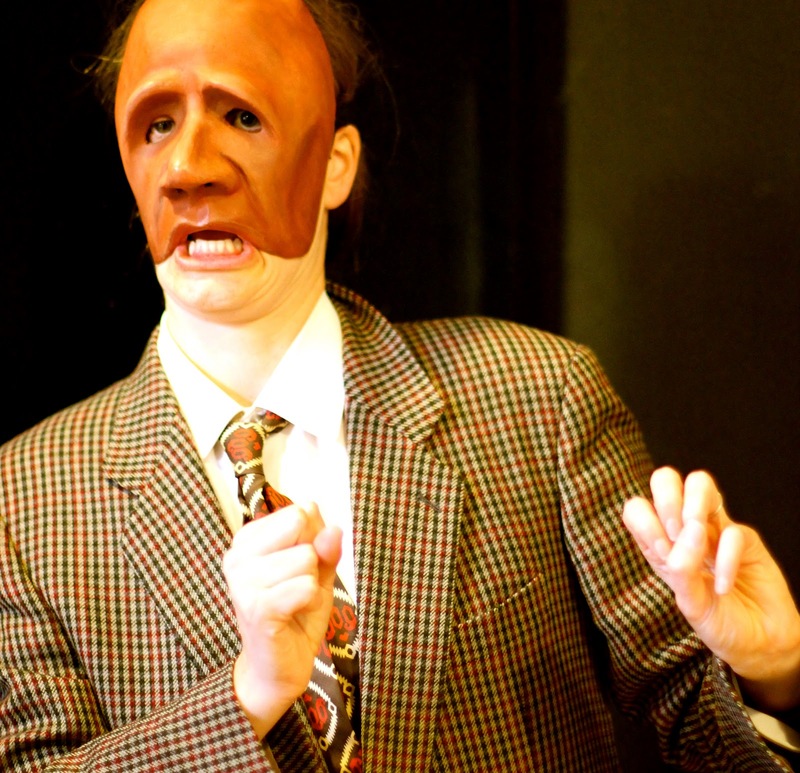 Of course we also played in mask - so the performance is immediately heightened to a whole other level of madness. And the thing is... as our teaches keep telling us... if the canovaccio works and the performances are good then the piece will work... but if you play... really play... its on a whole other level. You have to have fun. It's a rule. Have fun! It's not that easy. This is one of the most exciting things I have learnt. I know there are lots of exciting things. But this one rocked. It somehow incorporated aspects of everything we have learnt up till now. Changing the space. Character. Images. Technique. Rhythm. Madness. Slowly getting into the state of the Queen... 'Oh Dear!' ....Vampish. Over the top. Fickle. Confused. Me playing Polonius (in the mask Barbara made), Ophelia's father... You must remember this a kiss is still a kiss. So now... returned for the final term and slap bang into clown... The red nose. The smallest mask of all. Aaaah. And it is so terrifying. Because your clown is not a character. Your clown is somehow and aspect of you that wants to come out and play. And as Giovanni said the other day... sometimes other people love your clown more than you do... you cannot control what comes out... allow yourself to fall... aaaaaah. So it's the very beginning of this journey and we kicked off with solo performances for the first years... who of course hadn't seen our clowns yet. It wasn't a performance as such... it was more the reason for the clown... Sad. Mean. Bizarre. Needy. Pompous. Bossy. Chaotic. Militant. But all of them naive. Mostly funny. And sometimes poignant. We were allowed to use objects but no real skills like musical instruments, singing, dancing or too much talking. An object. And three minutes. Go. Make us laugh. I was in such a state that I actually walked on stage without my red nose on! I couldn't believe it. Of course I was told immediately and had to start again... Apparently this happens often... actors in mask shows step out with their masks on top of their heads having forgotten to pull them down. So funny. And a bit of gift... the more energy you have the better. It seams. I'll post some pics in the next one. So yes. Welcome to the wonderful world of clown. We'll see. Eee.